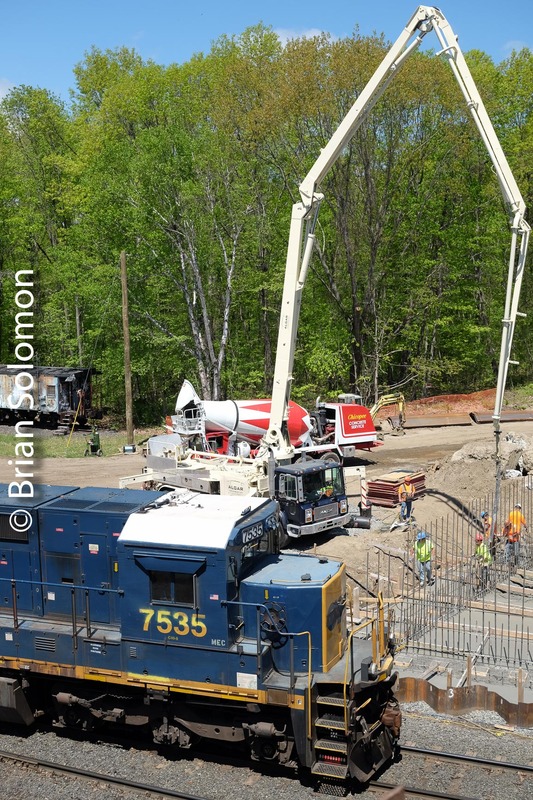 East Deerfield Railfan’s Bridge Update: Views from the New Bridge. 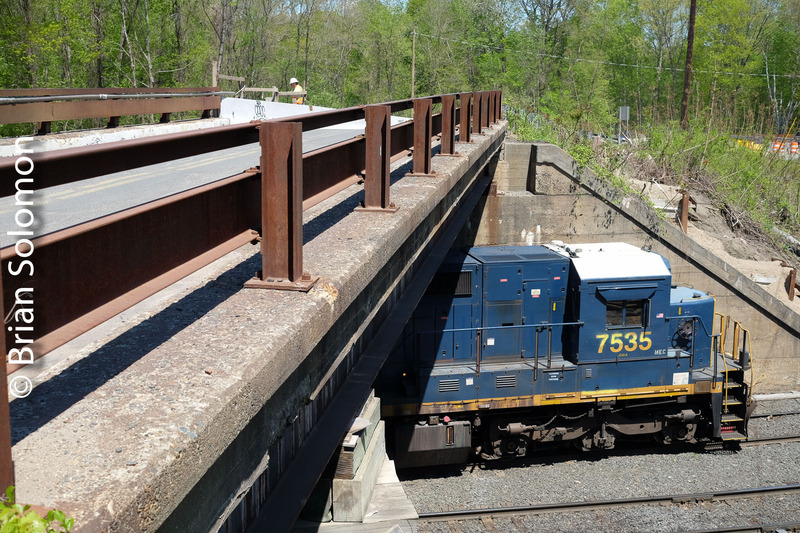 The old McClelland Farm Road bridge over the Boston & Maine tracks at the west end of East Deerfield Yard (near Greenfield, Massachusetts) had been a popular place to photograph trains. Guilford SD26 632 leads EDRP (East Deerfield-Rouses Point) westbound at McClelland Farm Road on August 30, 1987. Kodachrome slide exposed using a Leica M2. Known colloquially as the ‘Railfan’s Bridge,’ this vantage point had been featured in articles in TRAINS Magazine, Railpace and other popular literature for decades. For more than a year a new bridge, parallel to the old bridge, has been under construction. Last week, December 6, 2018, photographer Mike Gardner and I made a brief visit to East Deerfield to inspect progress. The old bridge was still in place, while the new bridge was open and mostly complete. Inevitably, fences will be installed, and how these may affect photography has yet to been seen. 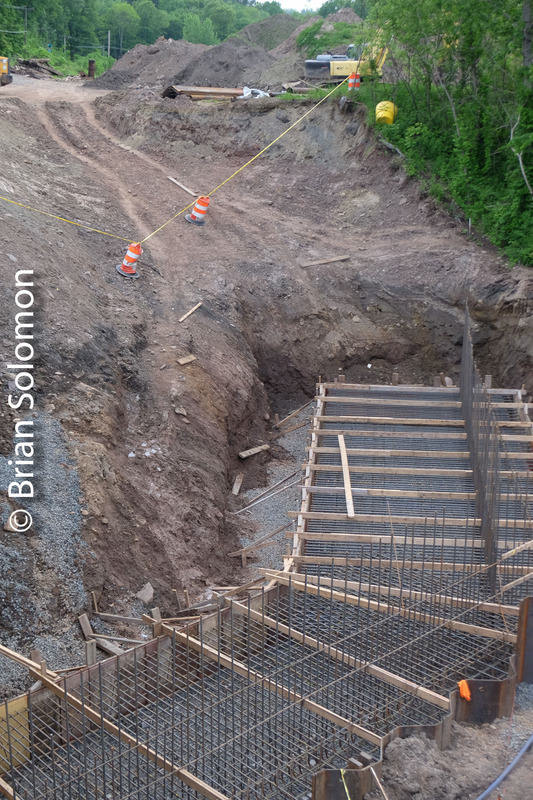 However, looking to the east, the view has been complicated by the erection of new electrical lines. 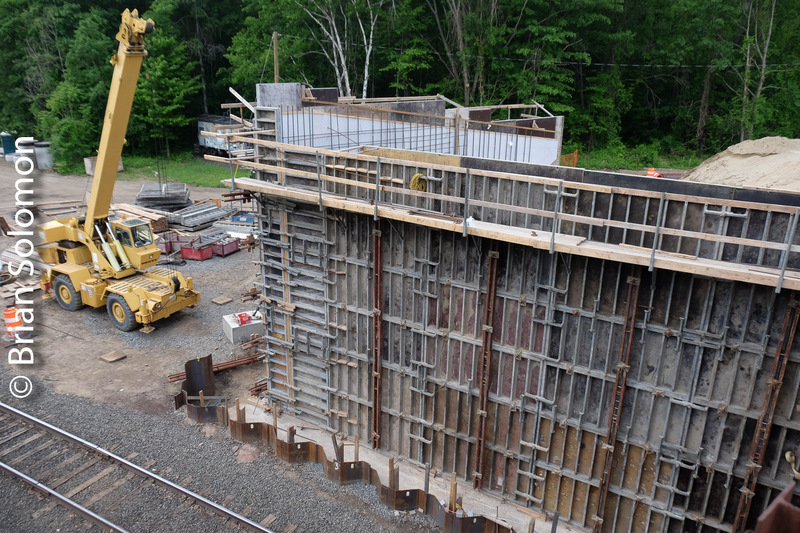 Below are a few views of the new and old McClelland Farm Road bridges. Panoramic view of the new and old bridges. The view looking west from the new bridge. Here’s the sorry state of the old bridge. How many thousands of photos were made from this span? Looking east from the new bridge. 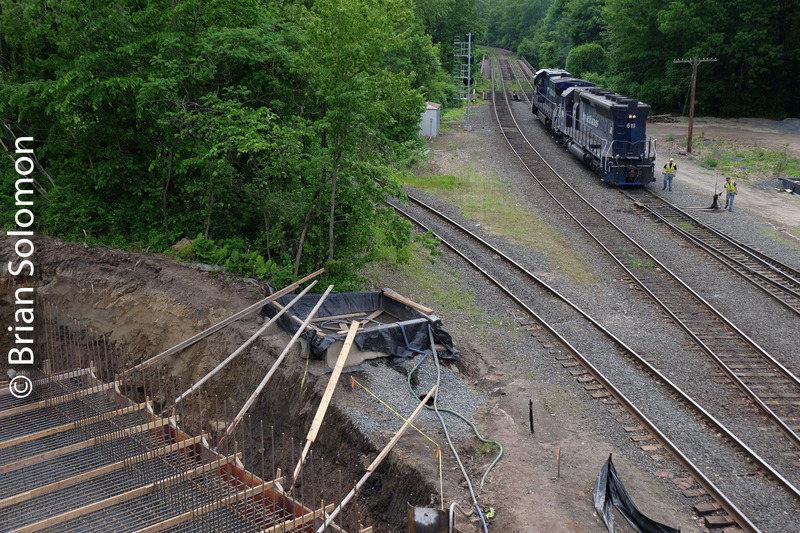 The view from the new bridge looking toward the East Deerfield Loop. 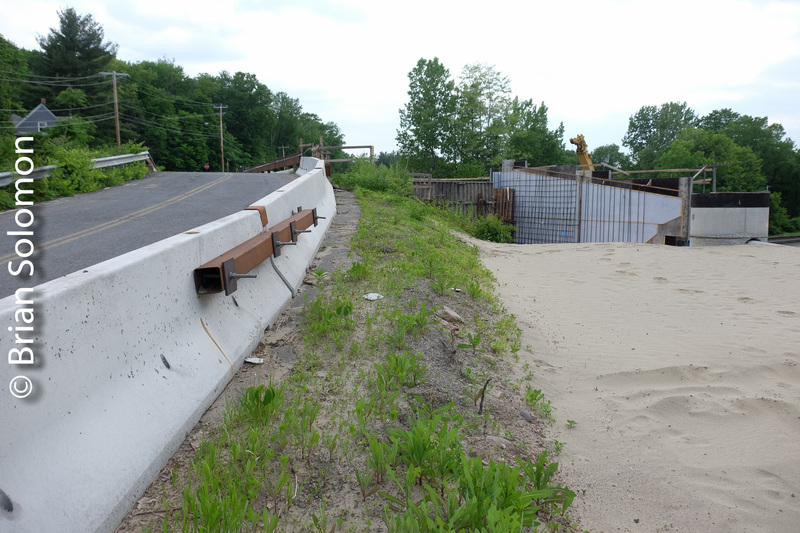 Railfan’s Bridge at East Deerfield—my First Farewell. 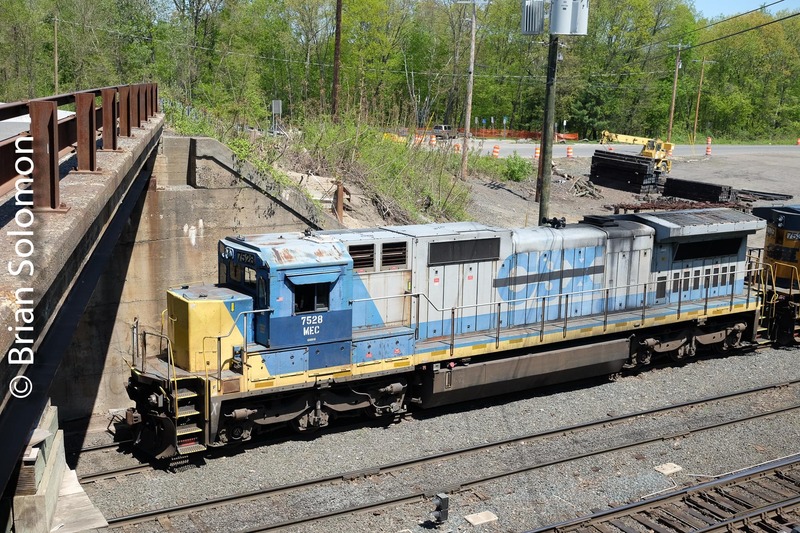 The old McClelland Farm Road bridge over the Boston & Maine tracks at the west end of East Deerfield Yard (near Greenfield, Massachusetts) has been a popular place to photograph trains since the steam era. Known colloquially as the ‘Railfan’s Bridge,’ this vantage point has been featured in articles in TRAINS Magazine Railpace, and other popular literature for decades. I first visited with my father and brother in the early 1980s, and have made countless photos here, many of which have a appeared in books, calendars, and of course on Tracking the Light. 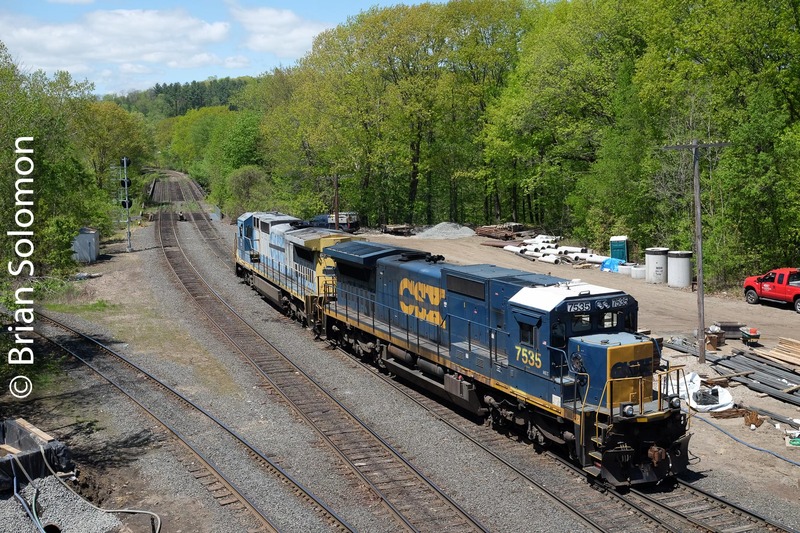 My friend Tim coined it the ‘waste too much film bridge’ in the early 2000s, owing to our propensity to make an excessive number of photos as Guilford freight trains switched in the yard. Although hackneyed and perhaps over frequented, it’s been a great place to catch the sunrise, make photos of the locomotives and freight cars, and work the evening glint. At times, I’ve seen as many as 30 photographers here, all vying for position. Imagine my surprise last month, when Tim and I arrived to photograph the elusive and much followed Pan Am Railways office car train, expecting to find a wall of lenses, and instead realized that we were the only photographers on site! In the evening glow, Pan Am Railway’s prized former Canadian National FP9s lead the company office car train off the Deerfield Loop track at the west end of East Deerfield Yard. Exposed using a FujiFilm X-T1 digital camera.
. You can see that the trees have been cut in preparation for the heavy works, expected to begin shortly. Lumix LX7 photo. How many thousands, or tens of thousands, of photos have been exposed from this vantage point over the decades? FujiFilm X-T1 photo. I used this opportunity to make some photos of the old bridge, soon to be replaced by a new span located 40 feet to the west. Why is this my first farewell? Simply, the bridge isn’t yet gone. After it is, perhaps I’ll post a ‘final farewell’. I wonder how the new vantage point will compare?